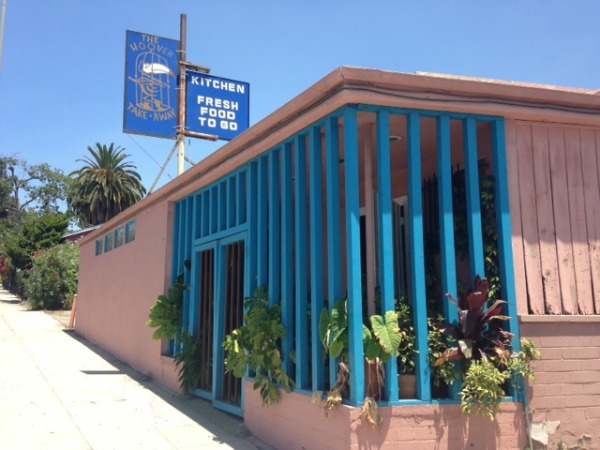 Ever wonder about that pink building on Hoover Street just south of Melrose Avenue, the one with an “A” health grade placard in the window that would seem to suggest an eating establishment? That place with a large sign of a caged skeletal Toucan hanging overhead, with the words “The Hoover Take Away, Fresh Food To Go” painted on it? Three weeks ago a sidewalk chalkboard menu appeared out front with a small list of items and promptly disappeared the next day. It turns out that the space, which seemed perennially deserted, belongs to the 25-year-old bohemian Silverlake hangout, Casbah Café. Owners Claudia and Paul Delarminat have used the space’s kitchen the past five years to prepare the food for their café. Only recently have they decided to debut a late night summer pop-up series here, serving classic Argentinian specialties starting this Saturday, July 19, from 6 p.m. to 3 a.m.. Their schedule is still undetermined, but said they will be open two to three times a week. Paul’s background in food is what you might call idyllic. A French-Argentine who grew up on a ranch in Patagonia, Delarminat grew accustomed to making his own jams, charcuterie, and fresh hard cider from nearby apple orchards planted by Jesuits. The pop-up, however, will center around street food and feature a simple, pared down menu. From the small take-out window out front you can order the South-American favorite choripan (fresh made chorizo on a crispy roll), lemon chicken breast, or the same selection of homemade empanadas offered by Casbah’s curbside service: beef, chicken, spinach, cheese, and elote. The Delarminats are also considering desserts like dulce de leche. Inside seating will not be available, but diners are free to eat in the cozy terrace out back. Could this mark the beginning of some sort of nightlife on a relatively dull corridor of Hoover, an uneventful strip populated by a couple of liquor stores, a marijuana dispensary, and Cafecito Organico? It’s not unreasonable to think so. Nearby Virgil Avenue—once considered a dead zone—was given a hefty boost from Sqirl. Casbah itself experienced something similar twenty years ago, when they first opened shop on Sunset thinking it would be a short-term solution to help boost sales for its textile and goods shop next door. Neighborhood dynamics have changed since their opening in 1988 when, as Deliminart describes, “we were barely making $50 a day and violence was a common reality.” A Hoover rebirth may just be on the horizon, and what better ambassador of the neighborhood could we ask for?